Chrysabelle is a highly regarded commarÃ©: a superior breed of humans created to feed vampire nobility. But her patron is murdered and finding herself under suspicion Chrysabelle is forced to flee her home. 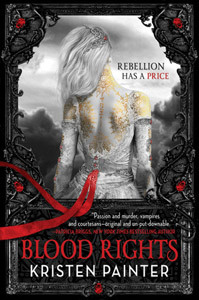 Her escape leads her to Mal, a cursed vampire with a complicated history. Under the curse any human he feeds from dies, so instead of taking any more lives and enduring the ghosts that remain, he hides himself from the world and stifles his desire to feed. Their fates are entwined. Chrysabelle and Mal have to overcome their mutual animosity and distrust and unwittingly find themselves dependent on one another. She needs the saliva of a vampire to ensure her strength and youth. He needs powerful blood but canâ€™t take it from the vein. With the help of some other supernatural allies, they must face the twisted desires of the vampire Tatiana as she strives to conjure the awful power of the Castus Sanguis: fallen angels. Painterâ€™s main strength lies in characterisation and Chrysabelle was at once a commanding yet realistically vulnerable heroine. Her appearance is so delicate that it belies the immense killing power provided by her training as a commarÃ© and I found myself rooting for her immediately. The world is rich in history and tradition and peppered with the right amounts of the vampire handbook – blood lust, sexual desire, danger, symbolism and the drawbacks of mortality – to make this series a welcome contribution to the genre. With the trilogy being released over three successive months, I expect the story will build to a satisfying conclusion in November.